Economics | Texland Petroleum, L.P.
Texland opperates about 1,000 wells in the West Texas region known as the Permian Basin. In the city of Lubbock, where Texland operates more than 100 wells, that production enhances the local economy. 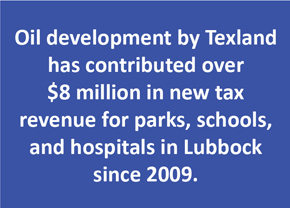 For starters, millions of dollars in tax revenues that directly support the schools, hospitals, and other city services benefitting Lubbock residents. 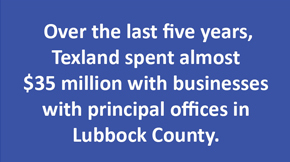 Over the last five years, Texland alone has paid more than $6,600,000 in mineral property taxes paid to the Lubbock Central Appraisal District. Royalty owners make additional ad valorem tax payments estimated at 25% of Texland’s payment, or an additional $1,650,000. Texland uses local businesses for its operations in Lubbock and surrounding counties including our largest drilling vendor, Lubbock-based Norton Energy Drilling, LLC. Texland operates a field office in Lubbock, employing 31 people including 11 Lubbock residents. Last, but certainly not least, is the revenues paid to landowners in Lubbock county by way of royalties. 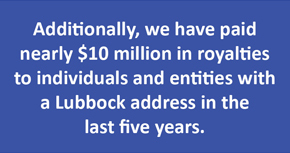 Our largest royalty owner in Lubbock County is the City of Lubbock, which has received $3,597,170 in royalties over the last five years.